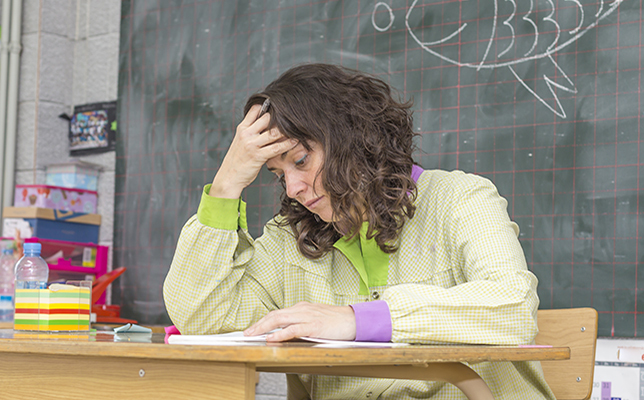 As the role of the educator continues to evolve, it is necessary to take a look at some of the challenges they face day-to-day: What contributes to educators’ stress? Have the recent changes in the federal government added to their stress at all? How can technology help? To find out the answers to these questions, online learning company Course Hero polled educators about their economic satisfaction, work-related stress, classroom technology and even how the new Trump administration impacts them. The company recently released its inaugural “State of the Educator Survey” report, which includes findings from a 68-question survey conducted in January. Course Hero polled 412 higher ed professors and 117 high school Advanced Placement (AP) teachers who work full-time and part-time in a variety of disciplines. As it turns out, all of the aforementioned topics have contributed to increased stress felt by nearly half of the survey participants. In fact, five times as many educators reported increased rather than decreased stress, with 42 percent responding that their job became more stressful in the last year (compared to 8 percent who reported a decrease). Exactly half of respondents said their stress level stayed the same. The biggest contributors to stress, according to the report, have to do with heavy workloads. Most educators (63 percent) reported that they work 10 to 20 hours over the typical 40-hour workweek. College and university professors typically put 52 hours into the workweek, while AP teacher respondents work 62 hours on average. Second to overtime is compensation: Nearly half of respondents (48 percent) pointed to stagnant wages as a cause of stress. Less than a than a third (28 percent) responded that they consider themselves “well-off” or “very well-off,” while 53 percent were “neutral” and 19 percent said they were “poor,” according to the report. A lack of support staff including teaching assistants, research assistants, graders, etc. is the third highest contributor of stress (cited by 42 percent of survey participants). In addition, student behaviors especially stress educators out with 56 percent responding that student behavior negatively impacted their work in the past year. Increased administrative regulations were also a trigger: 42 percent said that it adversely affected them. To add to these concerns, the recent election and policy changes have increased educators’ stresses. About 51 percent of college and university professors and 50 percent of high school AP teachers indicated that they expect the new administration to have a negative impact on education. Recently elected Secretary of Education Betsy DeVos’ policies in particular were viewed unfavorably by nearly half of respondents (45 percent). Meanwhile, job satisfaction was high, with 69 percent saying they would choose to become an educator all over again. On a scale of 1 to 5, more than half of respondents (57 percent) reported being “satisfied” or “very satisfied,” according to the survey. 53 percent said tech improved their efficiency. However, technology still has room for improvement. Specifically, only 34 percent of respondents said that iPads, smartboards, Chromebooks or 3D printers helped them in the classroom. The full report is available on the Course Hero site.